LOW MILES - 54,509! King Ranch trim. FUEL EFFICIENT 21 MPG Hwy/15 MPG City! Navigation, Moonroof, Heated Leather Seats, Heated Rear Seat, 4x4, Turbo Charged, Trailer Hitch, EQUIPMENT GROUP 601A LUXURY, TWIN PANEL MOONROOF READ MORE! Leather Seats, Navigation, 4x4, Heated Driver Seat, Heated Rear Seat, Cooled Driver Seat, Premium Sound System, Satellite Radio, iPod/MP3 Input, Bluetooth, Trailer Hitch, Remote Engine Start, Dual Zone A/C, WiFi Hotspot, Heated Seats. MP3 Player, Privacy Glass, Keyless Entry, Child Safety Locks, Steering Wheel Controls. EQUIPMENT GROUP 601A LUXURY Inflatable Rear Safety Belts, Multi-Contour Seats Driver and passenger, Blind Spot Information System (BLIS), cross-traffic alert sensor in taillamp, Tailgate Step w/Tailgate Lift Assist, Power-Deployable Running Boards, Wheels: 20" Machined-Aluminum, light Caribou painted pockets and Caribou wheel ornament w/Caribou King Ranch logo, Automatic High Beam w/Rain-Sensing Wipers Windshield wipers, Tires: P275/55R20 OWL Automatic Transmission (4), 275/65R 18 OWL all-terrain spare tire, TWIN PANEL MOONROOF, TECHNOLOGY PACKAGE Lane-Keeping System, 360 camera w/split-view display and dynamic hitch assist, ENGINE: 3.5L V6 ECOBOOST. 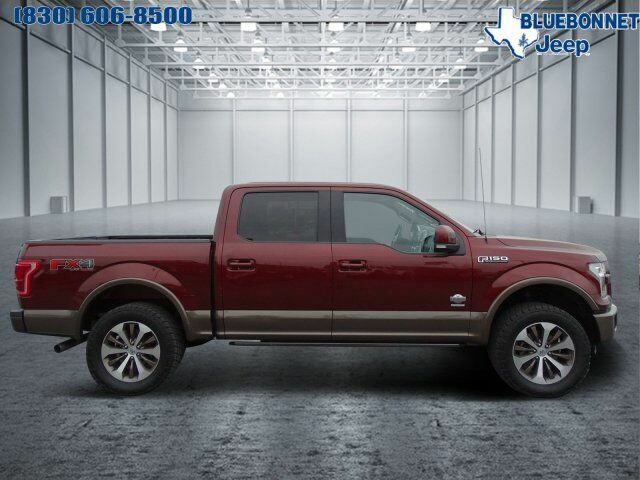 Ford King Ranch with Bronze Fire Metallic exterior and MESA, KING RANCH MESA LEATHER BUCKET SEATS -inc: 4-way adjustable driver/passenger headrests, heated interior features a V6 Cylinder Engine with 365 HP at 5000 RPM*.